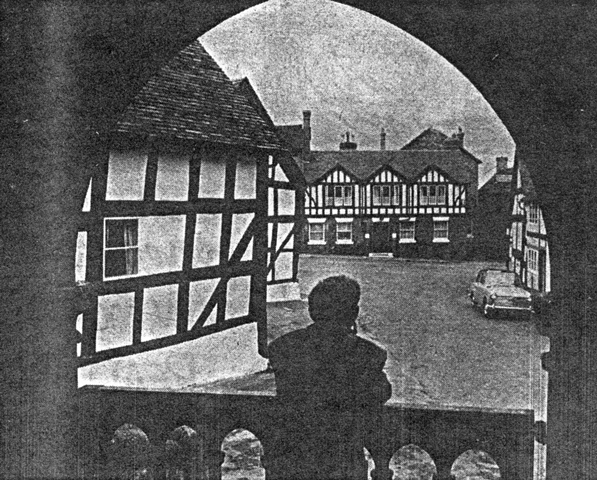 A peep into the past at Hodnet, where the half- timbered houses have changed little in 200 years. Have you ever sung the hymn “From Greenland’s icy mountains”? There is scarcely anyone in England who has not. It is a great favourite in most churches and chapels throughout the land. My wife and I had been asked to dinner at Hodnet Hall by Brigadier Heber-Percy and the information provided an opening gambit with my fellow guests. The brigadier – he has since died – informed me that Heber became later the Bishop of Calcutta. He apparently began his writing at Oxford where he won the Newdigate prize with a poem called “Palestine.” The best known lines of it relate to the building of the Temple. Walter Scott is said to have inspired them. It was being sung at a service in St. Luke’s (formerly SS. Peter and Paul) church in the attractive village of Hodnet as I passed by from Great Bolas on my way to Hodnet Hall one evening. I had to stop and listen to the whole of it, because I had never heard such fervent and enthusiastic singing. As I listened a yellow light punctured the fog, for it was in the depth of winter. The light swayed and a policeman materialised. “You seem to know a lot about it?” I observed. 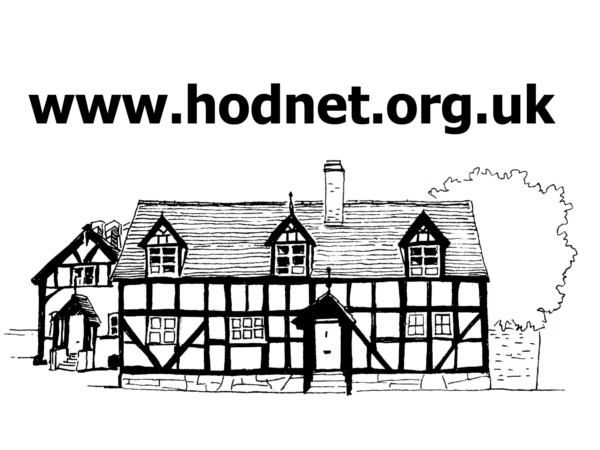 Hodnet Rectory seemed to have inspired the writing of prose besides poetry and hymns. The brigadier told me that Mary Cholmondeley, the attractive daughter of Rev. Richard Cholmondeley, for many years the rector of Hodnet, wrote the best seller “Red Pottage”. Another cleric is said to have written a thriller to explain away the greatest mystery connected with Hodnet Parish church – the discovery during repairs of a human skull in the chancel with a nail driven through into the brain. No one knew if the book was published. Brigadier Heber-Percy distinguished member of a famous family, told us all about magnificent gardens he had made, with the help of his gardener, Herbert Dobson, who had served, with him in the army. The gardens, now opened to the public were a typical example of the Brigadier’s energy and imagination. 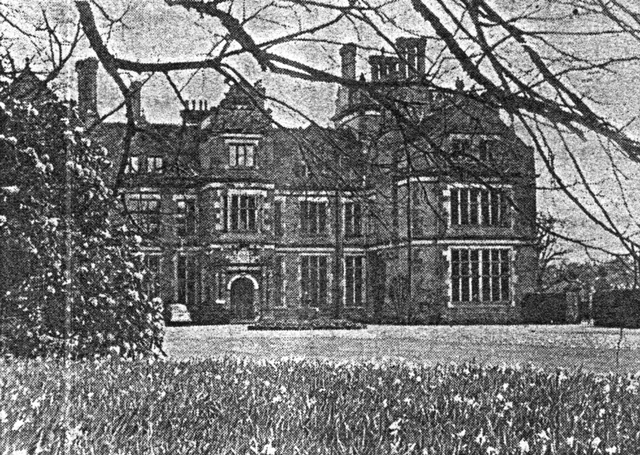 Hodnet, a huge family mansion standing in grounds with a lake, was not as old as it looked. It was rebuilt in 1870. How old the earlier structure was I could not find out but I was told of the unbelievable antiquity of the neighbourhood. The church was also restored in comparatively recent times-about 1883. A case was found in the grave of a priest in the chancel containing a chalice and paten as if those who buried the cleric believed, like the ancient Peruvians, the a need for such material articles in heaven. Not far away there is a Druids stone which has mystified many people. The moats of an ancient castle were discovered and excavations ascertained that the site had been occupied by a Saxon, a Norman and an old English fortress in turn. Most impressive evidence of the antiquity of the area near Hodnet are what are known as “Bury Walls” to the west. They were said to be one of the largest Shropshire camps and until just before the war were thought to be pre-Roman. Writing about Bury Walls Camden described them thus: A place where a small city once stood, the very ruins of which are almost extinct. The Roman coins that are found there with such bricks that were used in the building are evidence enough if its (the towns) antiquity and founders. The people of the neighbourhood call the place Bury from Burg. They affirm it to have been very famous in King Arthurs’s days as the common sort ascribes whatsoever is ancient and strange to King Arthur’s glory. I remember now how my wife and I enlivened the drive back late, towards Wellington through the fog, by discussing the mystery of the skull found in Hodnet church with the nail driven into the brain. There are few lovelier houses in Shropshire than Hodnet Hall, the home of the Heber-Percy family.